Q. What are the dates of the 2019 BOOST Conference? A. The 2019 BOOST Conference will be held April 30 - May 3, 2019 at the Palm Spring Convention Center in Palm Springs, CA. The Exhibitor Expo will be held May 1 - May 2, 2019. Q. What are the Exhibit Hall Hours? Q. What type of professionals attend the BOOST Conference? A. Please view our detailed attendee demographics page. Q. What booth options are available? A. Please see our General Information page for specific booth options and pricing. This year we are offering 6 types of booth options, including custom exhibits for unique ideas. Q. How do I know if a booth is still available? A. The Exhibit Hall Floor Plan is available on our website and will be updated frequently to reflect booth availability. In addition, once you are in the online exhibit registration system, you can view available booth location numbers in real time. If the booth is available, the number will be visible. If you do not see your desired booth location number, that booth has already sold. Q. What comes with the booth? A. All booths include pipe & drape, skirted table, chairs, I.D sign, trash can, breakfast, and lunch for registered exhibitors, and a company description in brochure and website. Please see our General Information page for more specific booth details. *Island booths contain no pipe & drape. Q. What sponsorship and advertising options are available for the 2019 Conference? A. All of our advertising and sponsorship options are located on our Sponsorship page at www.boostconference.org/sponsors. Sponsorship information is also available upon completion of the online exhibitor registration. In addition, you may contact us to inquire about any other sponsorship ideas your organization is interested in. Q. How can I promote my company? A. You can promote your company within your exhibit booth space or at any events your organization is sponsoring at the BOOST Conference. Please note that there is a fine of $250 for any flyers or marketing materials distributed outside of your paid exhibit booth or secured sponsorship on all conference facility premises. Q. How do I register to exhibit? 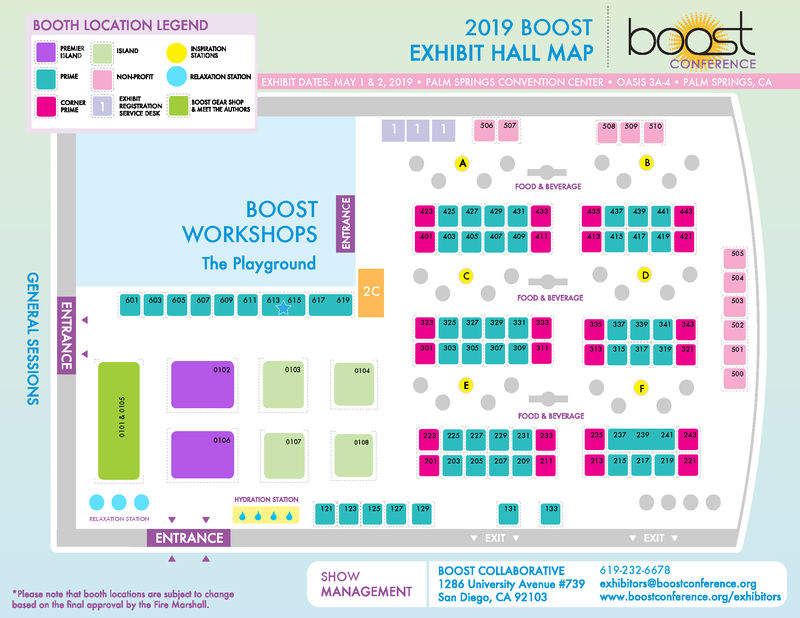 A. Exhibitor registration for the 2019 BOOST Conference is now available through our online system at www.boostconference.org/exhibitors under REGISTER TO EXHIBIT. The online registration system allows for convenient and environmentally conscious exhibitor registration, and allows you to manage and update your exhibitor information. Q. What is the deadline to register to exhibit for the 2019 BOOST Conference? A. The deadline to register to exhibit is Saturday, March 31, 2019. Q. How do I access my exhibitor online account after I have registered? A. You can login to your existing online account at www.boostconference.org/exhibitors under CLICK TO REGISTER; then click on the blue “ONLINE ACCOUNT” button at the bottom; Enter your email address and password. Q. What can I access and change in my online account? Q. Are meals provided for exhibitors at the conference? A. Yes, breakfast, lunch, and networking receptions are included for all registered exhibitors during the conference. Q. How do we get extra exhibitor badges? A. Each exhibit booth comes with 2-5 complimentary registrations depending on the booth option. Additional representatives not included in the booth package will have to register as an attendee through our main website or register on-site and pay the on-site attendee registration fees. Our conference has 1 access level; exhibitor registration includes all meals, general sessions, receptions, workshops, and special events. Q. What are the show colors? A. The 2019 show colors are Teal & White. Q. Is my booth carpeted? A. Yes, the convention center is completely carpeted. The color is *brown. *Additional colored carpet may be purchased from Show Decorator. Q. Does electricity come with my booth? A. No, electricity requests must be processed through the Show Decorator. Q. Will you be distributing attendee contact information before or after the show? A. No, the BOOST Conference does not offer an attendee contact list. We will be offering exhibitors the option to purchase Lead Retrieval scanners to capture attendee data. Learn more about purchasing Lead Retrieval here. Q. When will the Decorator Service Kit be available? A. The Decorator Service Kit will be sent out via email to registered exhibitors, and be available on our website at least 90 days prior to the conference. Click here for more information on the Decorator. Q. Where and when do I check in? A. Exhibitors who have registered and paid in full must check-in at the Exhibitor Registration Counter in Oasis 4 on Tuesday, April 30, between 11:00AM – 6:00PM before unloading and booth set up. Exhibitors wanting to add additional exhibitors to their booth will have to register on-site at the Palm Springs Convention Center lobby at the On-Site Registration Booth before entry will be granted. Please note that your account balance must be paid in full prior to booth set up. Q. Is WiFi provided in the Exhibit Hall? A. There is WiFi available in the Exhibit Hall for a charge determined by the AV Company. We strongly encourage you to bring a WiFi and/or MiFi Hotspot device. Q. Are there any fines to be aware of? A. To ensure the integrity of our Exhibit Hall, we have certain policies that if not adhered to, result in fines. No exceptions made. • Please do not set brochures or materials on any tables outside of your booth. Please note there will be a fine of $250 if this policy is violated. • Our policy states that you cannot move out until the designated time period on Thursday at 3:31PM. Please be respectful to the other exhibitors and attendees by refraining from moving out until 3:31PM on Thursday. This includes packing up supplies and/or disassembling your booth area. Please note that a fine of $350 will be assessed to any exhibitor that disassembles their booth prior to 3:31PM on Thursday, May 2. Q. What is the “Trash to Treasure” program? A. The “Trash to Treasure” program is sponsored by the Palm Springs Convention Center. During exhibitor move-out on Thursday, the program collects any on-site leftover exhibitor items such as books, toys, games and exhibitor materials, and donates them to the local Palm Springs Boys & Girls Club. This program will save your organization on return shipping, and will make a difference to local youth programs! Questions about BOOST Conference Exhibit Booths? Q. Do I need to provide a certificate of liability insurance and what information would I need to include? Q. Is there a cancellation deadline and fee? Disclaimer: The BOOST Collaborative makes every effort to provide quality services to all of our clients, however there may be circumstances beyond our control where we must determine what is best for the company as a whole. Please note that the BOOST Collaborative reserves the right to refuse service to anyone for any reason at any time.